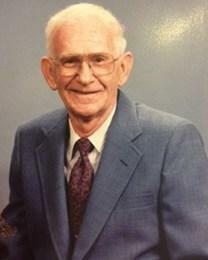 Fred F. Byrd, 93, of Orlando, FL passed away peacefully at his home surrounded by his loving family on October 4, 2013. Fred was born in Polo, IL to the late Bernie and Sophia Byrd on May 23rd, 1920. He spent most of his life in Jonesborough, TN with his family. In 1954, Fred and his family moved to Florida. Throughout his lifetime, Fred worked many jobs including one at the Orange Crush Bottling Co., Carpenter, and was employed by the Federal Government for the Navy as a Job Estimator. He was a veteran of the United States Army and served during both WWII and the Korean War. He was the eldest member of his church, Killarney Baptist of Winter Park, and was recently awarded the title Deacon Emeritus, one of three church members to earn such recognition. He also taught a men's Sunday school class for more than 35 years. On April 4th in 2009, Fred married Alma Holliday and the two cherished their wonderful times together. Fred loved to camp and travel, and he will certainly be missed by all those who knew and loved him. Fred is preceded in his passing by his parents; his first wife of 67 years, Zella; his brother, Bernie Jr.; and his sister, Illa Mae. He is survived by his wife, Alma; Daughters Helen Sherman, Ann Turbyfill, Judy Butler, Kathy Pratt, Beverly Kennedy, and Debbie McCollister; Son Floyd Byrd; Brothers Billy Byrd, Guy Byrd, and Kenneth Byrd; Sister Ruth Linkous; 14 Grandchildren; 25 Great-Grandchildren; 6 Great-Great-Grandchildren and one on the way; and numerous good friends. Visitation will be held Monday, October 7, 2013 from 4pm to 5pm at Carey Hand Cox-Parker Funeral Home, 1350 W. Fairbanks Ave., Winter Park, FL, 32789. Service will be Tuesday, October 8, 2013 at 10am at the funeral home. Burial to follow at Glen Haven Memorial Park of Winter Park. The family respectfully requests donations be made in Fred's memory if desired to Killarney Baptist Church at 701 Formosa Ave., Winter Park, FL 32789. Arrangements are under the care of CAREY HAND COX-PARKER FUNERAL HOME, (407) 647-1942, www.carey-handcox.com. "Sincere sympathy to your family as you celebrate the life of your loved one. May God bless you with strength and may memories surround you each day that..."